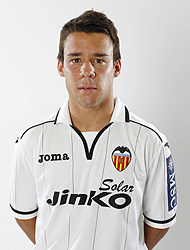 Valencia CF youth player Juan Bernat has not been satisfied with the low amount of playing time he's been getting recently and is not satisfied with the situation. The last match Juan Bernat played was against Mallorca in which he spend only 35 minutes as he was the sacrificial player in order to bring Ruiz, after Tino Costa red card. Since that moment Bernat has not played even a single minute and usually Jonas has been starting on the left position, though Jonas is not a wide player and tends to go in the middle and run in the penalty area. Juan Bernat has thus talked to Valencia CF coach Ernesto Valverde and has been told that he will get his chance and that he just needs to continue working hard. Chances are and this is my personal understanding that Juan Bernat will be loaned out in the summer, as will Paco once again until they get a lot more experience and iron out their mistakes.